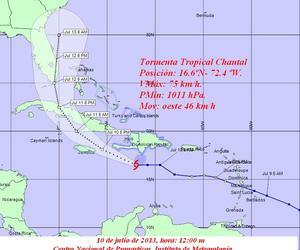 Tropical Storm Chantal degenerated into a tropical wave south of Cuba, according to the U.S. National Hurricane Center. While the remains of Chantal have winds of 45 miles per hour (75 kilometers per hour), above the threshold of a tropical storm, it lacks the structure to be classified a named system. All watches and warnings associated with it have been dropped. “The remnants of Chantal are expected to spread over Jamaica and eastern Cuba tonight and Thursday into northwestern Bahamas and over or near the Florida peninsula by Friday,” the hurricane center said in its last advisory on the storm at 5 p.m. New York time. Chantal was the third storm of the Atlantic hurricane season and these systems are closely watched because they can impact oil and natural gas production as well as orange crops. The Gulf of Mexico is home to 7 percent of U.S. natural gas output, 23 percent of oil production and 44 percent of refining capacity, according to the Energy Department. The Bay of Campeche, within the Gulf, is where Petroleos Mexicanos, Mexico’s state-owned oil company, has most of its production. Florida is the second-largest orange producer after Brazil. While Chantal is gone for now, it may return, said Michael Schlacter, founder and president of Weather 2000 Inc. in New York. Steering currents don’t have as much influence on waves, as they do on fully formed storms, so the remains of Chantal may drift westward into the Gulf. If enough of Chantal makes it into the warm waters of the Gulf, it is possible it could reform because conditions there are favorable.